Experience. When we take a longer journey, we always take some food and snacks. It's nice to have something if you get hungry or take longer trip. I baked these muffins for a such trip. I like this recipe because it's simple, quick. You can eat these muffins hot or cold. I also wanted to try non sweet muffins for the first time. We were happy with the results, they were very delicious. However, I didn't make these muffins exactly according to the recipe, put less bacon, so they shrank a little. I really wanted to try them with mushrooms, but ran out of them. Well, maybe next time... Should be delicious. Taste. 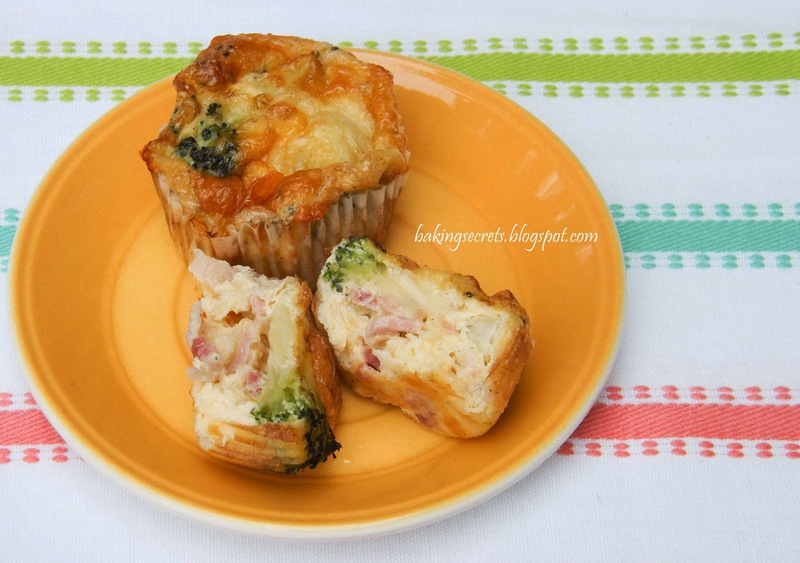 Nice and delicious breakfast muffins with eggs, bacon, broccoli and cheese, perfect for picnics. Can be eaten either hot or cold. They are delicious anyway. What I would do different next time. I didn't make these muffins exactly according to the recipe and put less bacon, so my muffins shrank a little. Next time I would put more bacon or other meat. Also I would try muffins with mushrooms or other vegetables. I used paper cases for baking and they stuck a little, so next time I would just grease the muffin tin. 1. Cooke bacon or any sausages and cut into small pieces. 2. Whisk the eggs with the salt and pepper. 3. 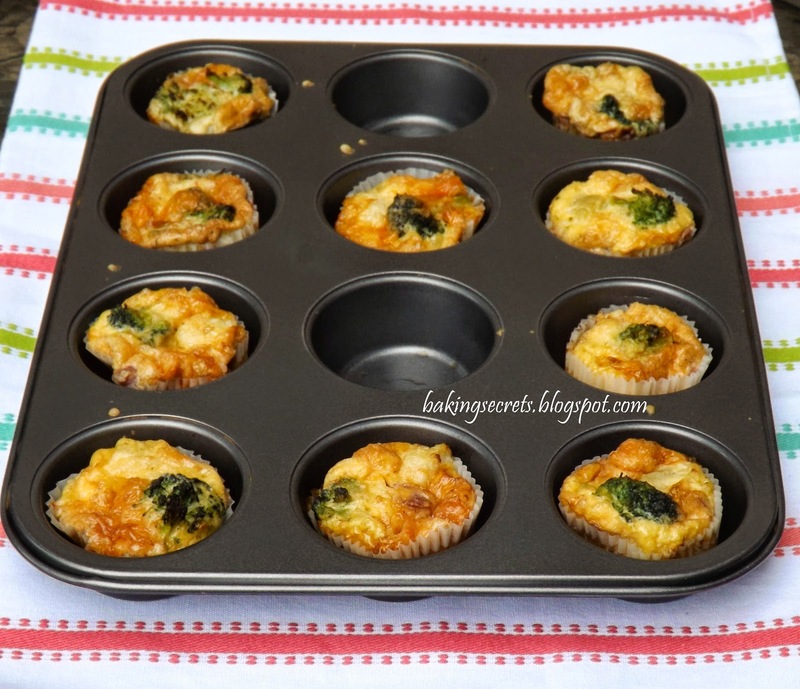 Grease a 12-hole muffin tin or line with the paper cases. 4. 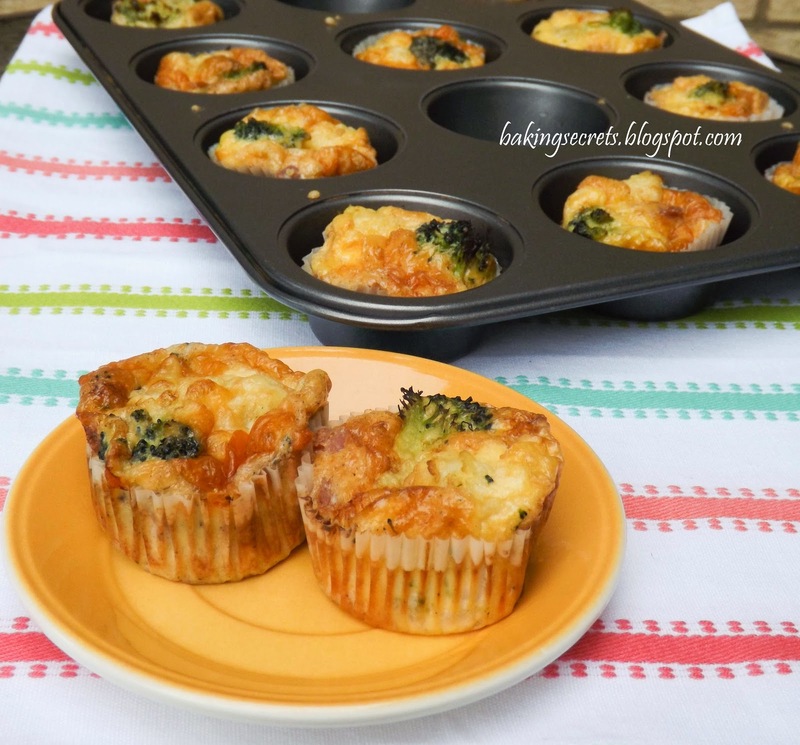 Put some bacon, grated cheese and broccoli pieces in the muffin cases. Pour the egg mixture, just leave a little room at the top. 5. Bake the muffins for about 25 minutes in the preheated oven 180ºC. Patirtis. Kai išvažiuojam kažkur tolėliau nuo namų, būtinai įsidedam maisto ir užkandžių. Niekada nežinai, kada išalksi ar kaip ilgai užtruksi. Šiuos keksiukus kaip tik kepiau tokiai kelionei. Receptas patiko, nes greitai, lengvai paruošiamas, valgyti galima tiek šiltus, tiek šaltus, visus produktus mes labai mėgstam. Be to norėjosi pirmą kartą pamėginti kitokius nesaldžius keksiukus. Rezultatais likom patenkinti, buvo labai skanu. Tiesa, aš nelabai žiūrėjau į produktų proporcijas ir dėjau visko tiek kiek mums patiko. Šoninės neturėjau daug, daugiau sūrio ir kiaušinių gavosi, todėl keksai atvėsę šiek tiek susitraukė. Labai norėjau pamėginti su grybais, bet deja, kaip tyčia jų neturėjau. Kitam kartui teks... Turėtų būti skanu. Skonis. Labai skanūs pusrytiniai keksiukai su kiaušiniu, šonine, sūriu ir brokoliais, kurie puikiai tiks piknikui (išvykai). Galima valgyti tiek šiltus, tiek šaltus. Skanūs bet kokiu atveju. Ką daryčiau kitaip kitąkart. Kadangi nelabai laikiausi produktų proporcijų, kitąkart dėčiau daugiau šoninės ar kitos mėsos, nes manieji šiek tiek susitraukė. Taip pat pamėginčiau keksiukus su grybais ar kitom daržovėm. Naudojau popierines keksiukų formeles, ne taip lengvai jie man nusilupo, todėl kitąkart kepimo formą ištepčiau tik riebalais ir nenaudočiau popierinių formelių. 1. Šoninę pakepkite (jei naudojate dešreles išvirkite ar apkepkite), smulkiai supjaustykite. 2. Kiaušinius išplakite, dėkite prieskonius: druską, pipirus. 3. Riebalais patepkite 12 keksiukų formą arba sudėkite popierines keksiukų formeles. 4. Į keksiukų formeles dėkite šoninės, tarkuoto sūrio, brokolio šakelių ir užpilkite kiaušinių plakiniu. Tik nepripilkite pilnų formelių, palikite šiek tiek vietos keksiukams pakilti. 5. Kepkite apie 25 minutes iki 180ºC įkaitintoje orkaitėje. Experience. It' a classic French dish. Lorraine is a north east region in France from where this dish came from. There is no cheese or tomatoes in the old original recipe. 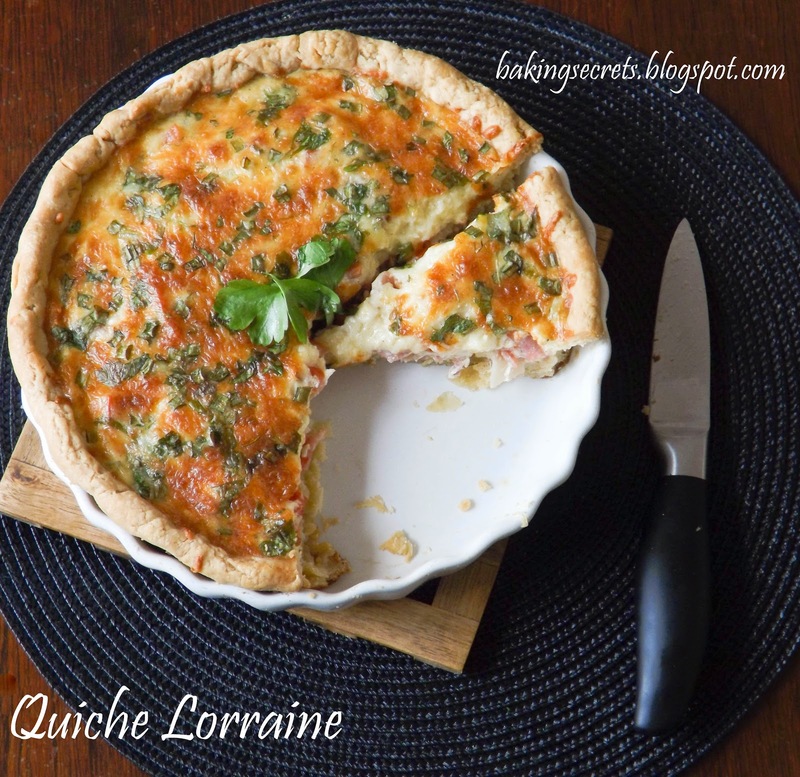 I made this recipe from several modern Quiche Lorraine recipes. And do you know what? It's delicious! Taste. 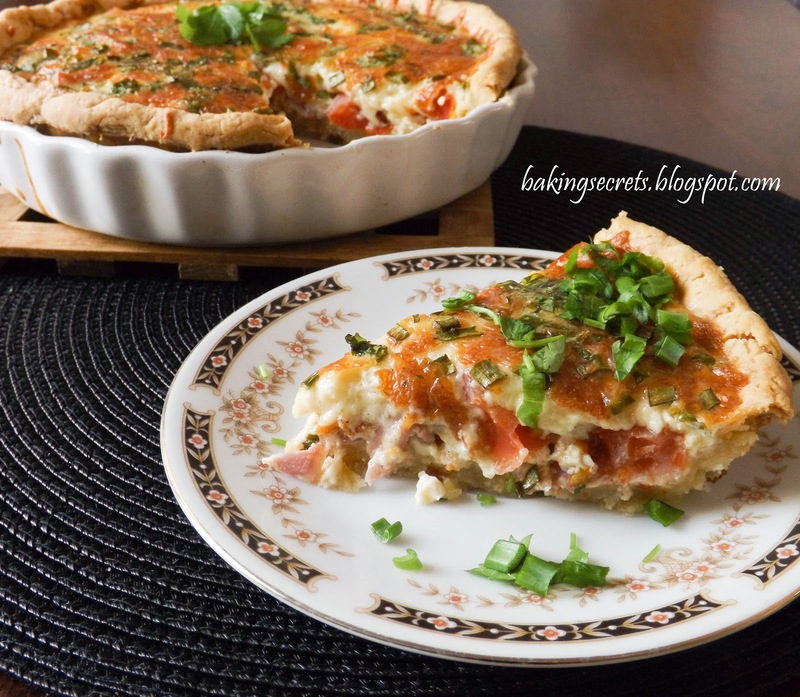 Delicious quiche with rich, creamy filling and crisp golden case. Delicious, light and great dish for dinner. Can be eaten either hot or cold, so great for picnics. What I would do different next time. Nothing. 1. 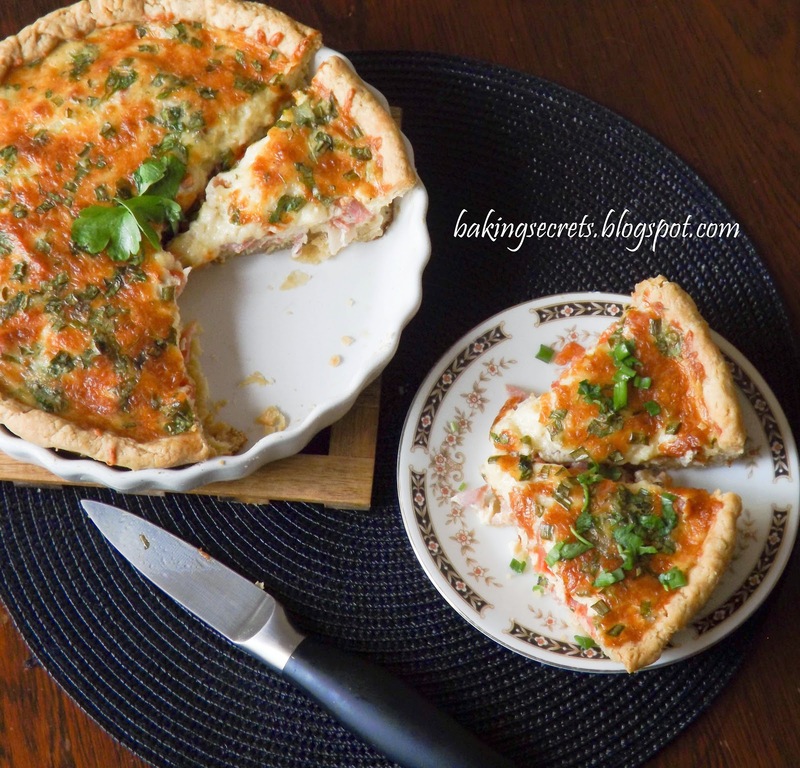 Make the shortcrust pastry as in the recipe Here. You can buy ready to use shortcrust pastry in the shop. 2. Roll the pastry into a circle to fit into the tart tin. 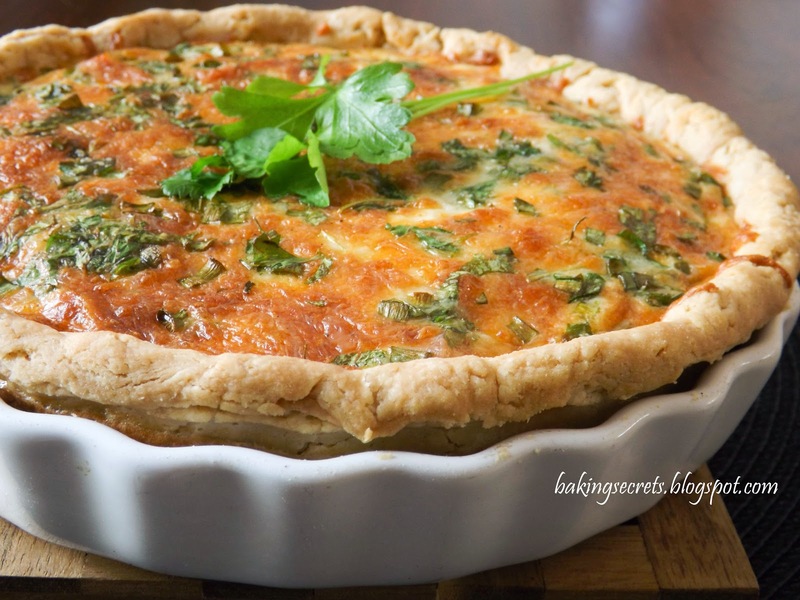 For this recipe you need 20 cm tart tin. Line the tin with the pastry, prick the base with a fork. Chill until very firm (at least 30 minutes). 3. Line your tart tin with baking parchment, fill with baking beans (I used rice). 4. Heat oven to 190ºC and bake for 15 minutes, or until the sides of the pastry have set firm. Remove the beans and parchment, then bake for 10-15 minutes more until the pastry feels dry all over. 5. For the filling, beat the sour cream, eggs until they are smooth. Season well with salt and pepper. 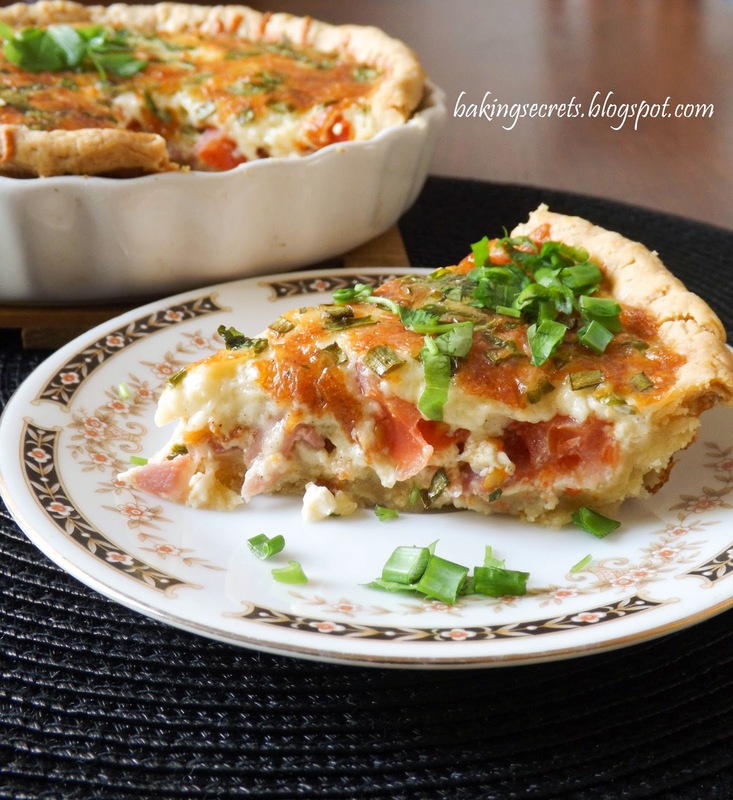 Chop cooked bacon, tomatoes, spring onions into small pieces and add to the tart case along with the mixture and the grated cheese. Fill the pastry case with the mixture and return to the oven for 30-35 minutes until risen and just set. Patirtis. Tai klasikinis prancūziškas patiekalas, kurio pavadinimas kilęs iš šiaurės rytų Prancūzijos regiono - Lotaringijos (pranc. Lorraine). Senoviniam orginaliame recepte nededamas sūris, pomidorai. Šis receptą 'sukontsravau' iš kelių šiuolaikinių. Ir žinot ką? Labai skanu. Skonis. Skanus kišas su kreminiu, sočiu įdaru ir traškiu pagrindu. Skanus, nebrangus ir nesunkus patiekalas pietums. Galima valgyti tiek karštą, tiek šaltą, todėl puikiai tinka piknikams. Ką daryčiau kitaip kitąkart. Nekeisčiau nieko. 1. Pagaminkite kapotos tešlos tartos pagrindui. Kaip pagaminti, receptą rasite Čia. Arba galite naudoti pirktinę tešlą. 2. Iškočiokite tešlą į apskritimą didesnį nei tartos forma. Šiam receptui reikia 20 cm tartos formos. Išklokite formą tešla, subadykite šakute tešlos pagrindą. Vėl dėkite į šaldytuvą bent 30 minučių atvėsti. 3. Išklokite tartos formą kepimo popieriumi, supilkite kepimui skirtus akmenukus (aš naudojau paprastus ryžius). 4. Įkaitinkite orkaitę iki 190ºC ir kepkite tartą 15 minučių, arba kol tešlos kraštai sutvirtės. Išimkite kepimo popierių su kepimo akmenukais (ar ryžiais), dar kepkite 10-15 minučių, kol tešla atrodys visiškai sausa. 5. Įdarui, grietinę išplakite su kiaušiniais iki vienalytės masės. Gerai pasūdykite ir papirinkite. Keptą šoninę, pomidorus, svogūnų laiškus susmulkinkite, sūrį sutarkuokite. Viską suberkite į tartos formą ir užpilkite kiaušinių-grietinės masę. Dėkite atgal į orkaitę kepti 30-35 minutėms, kol iškils, o vidus sutvirtės. Experience. Smoked Bacon Buns remind me delicious times in my childhood with my grandmother and dear mother who used to bake these amazing buns. It doesn't matter if they were not perfect, it was a delicious miracle in those days. 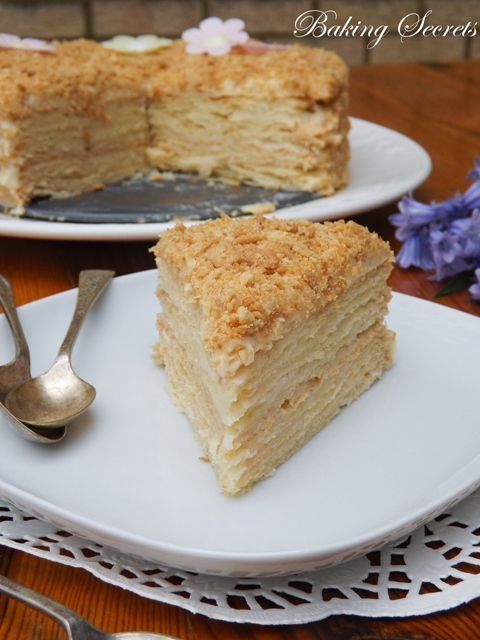 Once I saw this recipe on Aguonele blog, I knew I need to make them. I want to create the same good memories for my lovely daughter someday. However, this will happen in the future because she is still a baby. Now about making and baking. I usually use instant yeast for such bakes. They are very easy to use, quick and hard to go wrong. Every time I use them, the result is just perfect. This time I used dried yeast. Bought them by mistake and wanted to try the traditional way of making this kind of dough. Some tips: do not overheat the milk because the yeast will die and won't be active. Check the milk temperature with you finger, it doesn't have to burn; Always put some sugar in the liquid (warm milk or water) with the yeast, it will feed and activate the yeast. There was no problem for me making the dough. However, I was concerned how to form nice buns. Everything went very well. The buns were really nice. I was so proud of myself. From this quantity, I got 11 small, but very delicious buns. Taste. 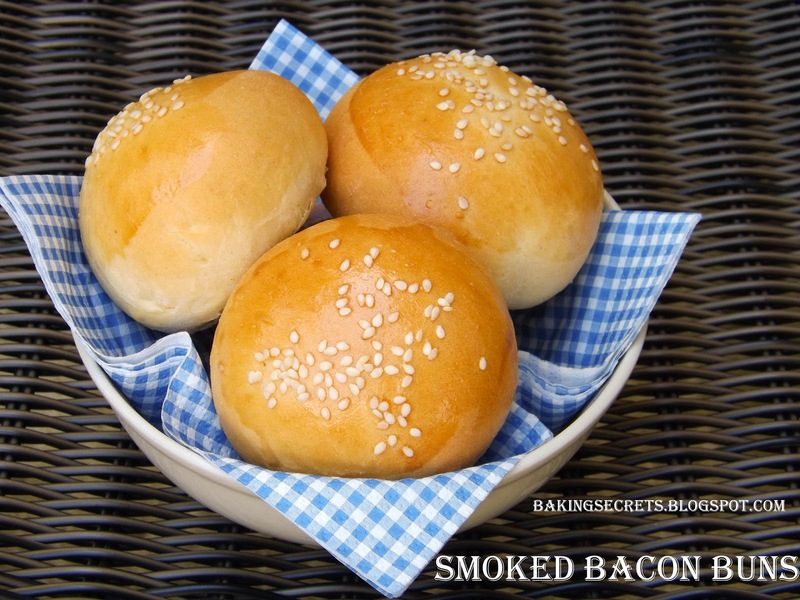 Very delicious, fluffy, soft, light, juicy buns with smoked bacon. The smell is very tempting. What would I do different next time. Would not change anything. The buns are just perfect.